If you’ve spent any time at our Silverock Cove community on Smith Lake, you know how we feel about the nature. It’s one of the key reasons to escape the city for a little lake living, after all, so we work hard to preserve it. We love finding inspired ways to build around it so our communities feel less like a lakeside suburb and more like a lakefront escape. All of which sounds great until you buy a property — like our Hawk’s Nest community — that’s already largely cleared. The challenge then is to take advantage of open space without losing lakeside charm. Working with our friends at Nequette Architecture & Design — design geniuses, those folks — we came up with a plan to turn a bare field into a community amenity. Our solution? Create a generous common lawn, add an eye-catching crescent of a pool, punctuate it with a watchtower. 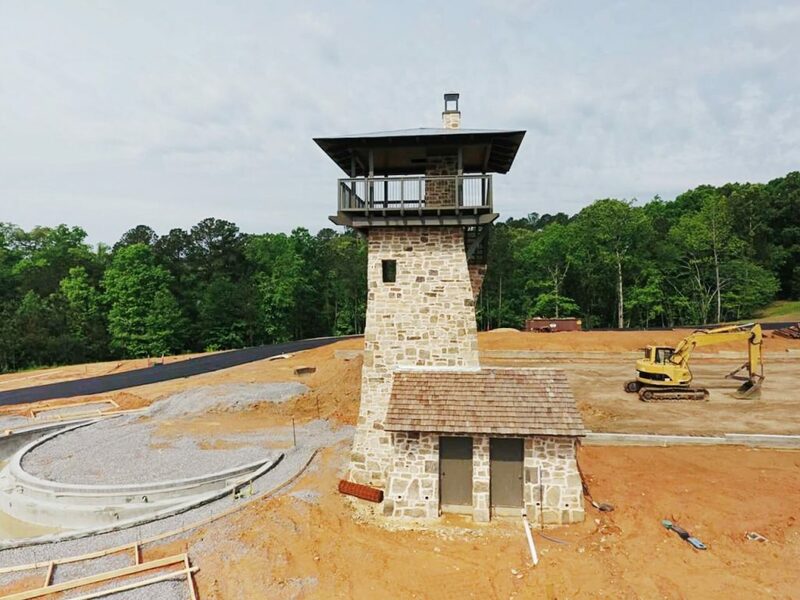 Covered in stone and topped with an open-air platform, the Hawk’s Nest watchtower is a functional emblem of the community. It takes advantage of the community center to give residents the one thing lakefront living almost never can: sweeping, panoramic views. We’ve tried to create a balance between personal escape and community spirit. Lake fronts and private docks give you space to get away; our pool and lawn areas give you a place to connect. They’re nice amenities for a lakeside community, offered here with a singular style. If Silverock Cove’s sprawling trail network reminds us of a luxury summer camp, Hawk’s Nest feels like a family compound. Situated on a single peninsula around a circle of road, it’s designed to be a completely different experience from our other Smith Lake development. Not better; not worse. Just a thoroughly alternative option. You go to Smith Lake for the quiet, naturalist atmosphere, for homes that are close to the land. But what our communities can add — either with lakeside trails at Silverock or our inventive little lookout at Hawk’s Nest — is a wide lake view.